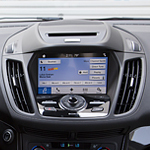 One of the unique features in the Ford Escape that many drivers really appreciate is the Adaptive Cruise Control system. Set your desired cruising speed, then the system uses the forward mounted sensors to spot a lead car so a buffer can be created. That buffer is easily maintained when your vehicle will automatically brake or accelerate as needed.